Kate Middleton’s baby could arrive any day now – so imagine our surprise when we learned that Prince William plans to play in a charity polo match this coming Sunday. Could the Duchess of Cambridge give birth sooner than we thought? Kate‘s due date has long ben rumoured to be 13 July – this coming Saturday. While Buckingham Palace has refrained from releasing her actual due date, spokespeople for the couple have confirmed that the Duchess‘ first child is due ‘mid July’ – meaning that he or she is likely to arrive this weekend. But that hasn’t stopped Prince William from fulfilling his royal duties. 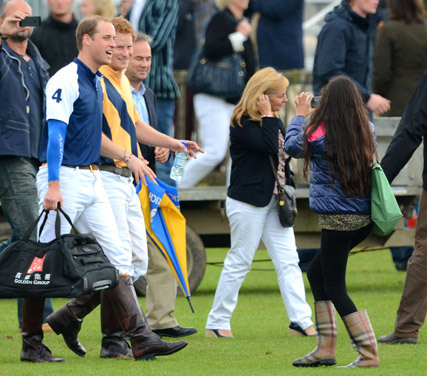 It’s being reported that the Duke of Cambridge will visit Gloucestershire this weekend to take part in a match at the Cirencester Polo Club to raise money for two of his and Kate‘s charities – Centrepoint and Child Bereavement UK. Prince Harry will also play in the tournament, raising funds for his own chosen charity, WellChild. A source in the polo world told Us Weekly today: ‘Clearly, if the Duchess gives birth before, he won’t be there.’ Kate Middleton famously told well wishers back in April that she was due in ‘mid-July’, but said she’d heard that ‘babies have their own agenda’. Prince William will be playing 94 miles away from Kate, who’s rumoured to be staying in London so she’s close to St Mary’s Hospital, where she’ll give birth. We’ll bring you regular royal baby updates throughout the week… here’s hoping Prince William makes the birth! WHICH MEMBER OF THE ROYAL FAMILY HAS JOINED TWITTER?